Phubbing!? Yes, otherwise known as the ‘act of snubbing someone in a social setting by looking at your phone instead of paying attention’. Coined by Alex Haigh from Melbourne, phubbing has caught on around the world and he wants to stop it in its tracks. 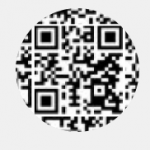 And as much as I love reading your comments, it is slightly depressing that my phone can sometimes get more attention than the human beings in my immediate vicinity. 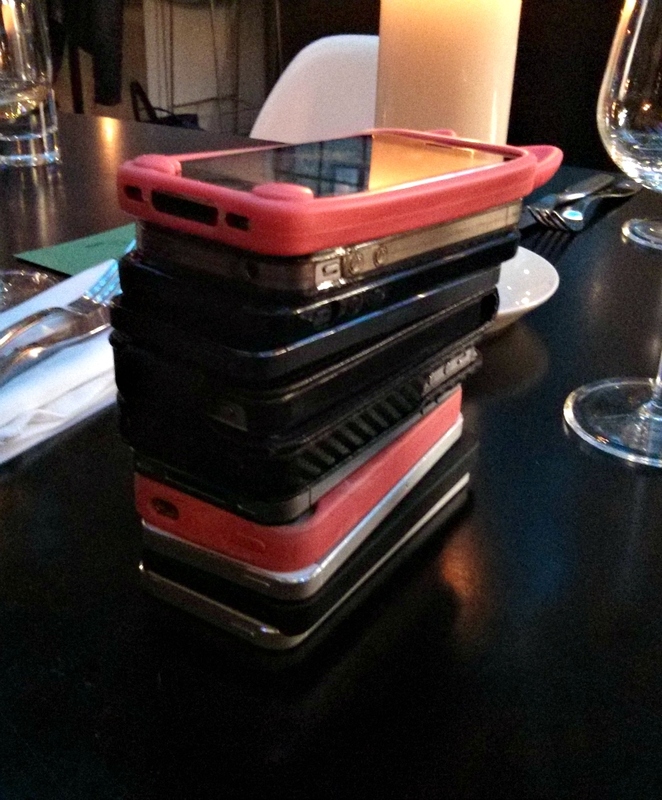 At one birthday dinner, we confiscated all of our smartphones and placed them in the centre of the table while we enjoyed each others’ company. You can see the stack of iPhones in this picture (being the only Android phone owner there, I took the photo). Perhaps such voluntary confiscation is the only way to keep our grubby hands from phubbing? So, do you get annoyed by phubbing? Have you ever confronted someone who was ignoring you in favour of their phone? And if you’re phubbing right now while reading this post, I feel honoured, but why not pop your phone in your pocket and talk to the person next to you? It’s not discrimination unless she didn’t get the sandwich. The girl was rude – whether her rudeness has an explanation in disability or not. Hello Morag, that Twitter example may not have been the best as phubbing is mainly about people you know (friends and family) using their phone instead of engaging with you. No offence was meant, so I’ve changed the example tweet. As I replied on Twitter, I’ve been supporting the ASD community for 25 years (including my DH and 6 kids) and most ASDers use their phones like this as it’s the only way they can cope with being in a public place and/or social setting including with friends and family. It’s a way of shutting out sensory overload and avoid engaging in social communication and stressful situations. It’s a coping strategy for a disability. Labelling people as RUDE in these circumstances is disability discrimination. Purely from experience, I would say this would account for a lot of “phubbing”. I have no doubt that your explanation is right in some circumstances, Morag, but there are many who don’t think enough about others. Examples include people who do not switch off their mobiles when attending events and those who have a phone conversation in front of others rather than going out of the room. When I was a child, my mother insisted that the TV was switched off if anyone visited the house, to give up my seat to adults in buses and many other ways of showing respect. Through working in education, I have met and helped many with disabilities, but also encountered many who know very little about etiquette and consideration for others. Why just people you know? The lunchtime sandwich example fits perfectly well with the definition of ‘phubbing’. PS This last post was in reply to Patrick’s comment. There is no way of telling whether the girl in the example was just rude or she had Asperger’s Syndrome (AS). I have AS and I find it very hard to look at people when I am talking to them (with the exception of my very closest relatives). To those who do not understand, I may come across as rude, even though, in common with other people with AS, I have no intention of being impolite. I agree about sensory overload and the stress caused by social settings. But I also know that I could not cope with ordering a sandwich AND checking my phone at the same time. I would have to do one thing at a time; multitasking is, for me, very difficult and highly stressful. Therefore, was the girl just looking at her phone (not checking or doing something on it)? That would be a clear way of telling between possible AS and downright rudeness. As none of us were there, the verdict remains open. Anti-phubbing strategy: Carry a book. When phubbed, pick it up and start reading. Carry on reading even when phubber has put down their phone. I check my email very frequently and have posted a some short comments on this website when I’m supposed to be looking for information on a topic, when out with friends. That’s on a tablet or laptop, and not on my phone. I confess to doing the same (on a laptop computer) , except that it is in the company of my better (?) half. No wonder that she gets rather annoyed! ‘Phubbing’ should be renamed, to include these other devices. Phubbing is not going to enter my dictionary until I have a better understanding of its meaning. Further down the page, Em has mentioned its use in the context of dangerous antisocial behaviour. Regarding your last paragraph, I already do. She is fine when I am looking up things that she wants, but I find it hard to resist the temptation to take an aside and check my emails or do something else that is for me. The book suggestion above actually reminds me more of what many aspies did in the days before mobile phones: they’d carry a book and sit in a corner reading when social situations got too stressful. I’m not sure why a lack of battery power affects the social acceptance of this – just a longer history? In a few years phone interaction will be more widely considered as acceptable and some other new thing will be frowned on. And as for this vitriol towards people using their phone (possibly to interact with other friends or deal with emergencies – you have no way of knowing). What comes across is a great sense of entitlement. Try turning it round and looking at it from a different perspective. It’s like “I’m the most important person in the room. I demand you pay attention to ME!” Needy much? Who’d want to interact with someone as egocentric as that? If there is a time when it is essential to check a new e-mail or respond to a phone call when socialising with friends or family members there are polite ways of excusing oneself and of doing it discreetly. Instances of phubbing I have seen have included men out with their girl-friend, wife or partner who, in the middle of a conversation, pick up their phone to check a soccer result or some such. I think in social situations we are all entitled to the undivided attention of the people we are talking to, and this also applies in group situations where it is not acceptable for individuals to just abstract themselves in order to attend to their smartphone; the worst thing is when they – perhaps apologetically – feel obliged to identify or explain their distraction in an attempt to justify their behaviour. I noticed in a TV documentary on Channel 4 last night about life in Germany how the use of cell-phones in the workplace is banned during working hours [as is using the office computer to send personal e-mails]. In my opinion there is absolutely no excuse for phubbing. Metal Samurai – You have got it the wrong way round! To break off to attend to your telephone when you have arranged to have time with friend sends a clear message that your telephone, and therefore YOU, are more important than your time with those friends. The issue here is manners which are a concept a lot of people nowadays sadly fail to understand. If you are with a few friends and have arranged to meet or have a meal, it is good manners to engage with those people with your full attention. Very occasionally you may be expecting an urgent call (or if you have a baby sitter need to keep your phone on), in which case it is good manners to warn your friends at the beginning of your time that you are expecting an urgent call and may have to leave for a few minutes to take it. Otherwise turn it off and pick up your messages later. There is almost nothing that is so urgent that it cannot wait an hour or so. The TV programme I referred to above was called “Make Me a German” and was on BBC2, not Channel 4, in case you wanted to catch up with it. The vitriol is often deserved. Even where the use of mobile devices is prohibited, some people think they are above the law and their conversation or text is more important than other peoples' property and lives. Selfish as it might seem, my entitlement is to enjoy a safe system of transport and I do demand you pay attention to ME when you are driving. Put the phubbing* phone down!!! *The exact spelling of this word varies according to the degree of inattention by other road users. You are a bit off-topic, Em, but I very much agree with you. We could lose friends by ignoring them in a social environment, but that is rather different from loss of life due to people being distracted by phones and other gadgets in their cars. Em, we’re not talking about using a mobile phone whilst driving (dangerous and illegal in most places), or using a mobile on an aeroplane (harmless, but usually still banned). Nor were we talking about rude people talking loudly on their phone at the cinema/theatre/library. I thought this was about people (silently) burying their nose in their phone to text/tweet/email and carry on conversations with people not physically present. The implicit assumption is that an online contact is not worth as much as IRL face to face contact; I’d like some evidence that’s actually the case as I suspect for very many people that’s simply not true and their online friendships can be more rewarding and fulfilling by having more in common than with those who happen to be physically nearby. Really it’s about the hurt feelings of somebody who wants your attention. Deliberately hurting their feelings by “phubbing” would be very rude. 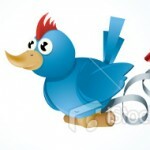 If there is something urgent or important then perhaps an explanation can smooth ruffled feathers. But do bear in mind there really are many people on the ASD spectrum who find social situations very stressful and need this as a coping strategy. Unless you’d rather they just stayed home and out of sight altogether? Some may be checking Facebook or Twitter, but many in companies or organisations look at their phones because of communications from colleagues. I am never sure if this is an obligation or voluntary – probably a bit of both. I agree that some explanation is useful if your attention is diverted, particularly if you are with one person rather than a group. @MetalSamurai – I appreciate this Convo is not about using mobile phones whilst driving per se, but it is about the behaviour of individuals in a social context. Whatever it is that compels some individuals to consider phoning, surfing or texting a priority in the presence of others, is no different whether it occurs amongst friends, in the workplace, or on the roads. It is only a matter of degree and it is therefore a fault in the behaviour of the individual, not those around him. I personally get very irritated when some at work walks up to my desk, asks for assistance with something, and then when they have my valuable attention, they get distracted by an incoming mobile phone call. I don’t pick up and answer my desk phone in that situation, so I expect a similar courtesy from others. In a leisure context not all friends are equal. I would not dream of inviting some friends to a social outing and then spend time on my mobile phone talking to others. If one of my guests does it, it would not bother me – provided they go somewhere private and don’t annoy my other guests. I think any generalisation is pointless. Em – Your link to the article in the Independent is clearly using ‘phubbing’ in the context of dangerous use of phones, which is rather different from the antisocial behaviour Patrick refers to in his introduction. I was not familiar with the term and am not keen on it if the meaning is ambiguous. I also wish that some people would understand how rude it is to have the TV on in the middle of a meal or when visiting someone. Em’s first comment could be extended to use of mobile phones in other prohibited situations, such as petrol stations and hospitals, where life could be endangered. What a disheartening view of future society. It is going to be a highly unpleasant world where people spend there time recording other people with their Google glasses whilst listening on earpieces and carrying out conversation with absent friends via voice mikes. Thank God Germany exists to show that successful societies can exist without surrendering to mobile phones/Facebook, and Twitter. The use by the BBC and other media outlets at an early age gave these last two commercial organisations a great fillip in acceptability and importance. BTW Germany has lower Facebook numbers than France and the UK despite a significantly larger population – and a better performing economy. I acknowledge that what is considered acceptable will change with time. In my view, a lot depends on context. If three or more people are present, one may not have any interest in a conversation. If others are discussing sport, I cannot make any useful contribution and don’t see a problem if I look at my tablet. If I am discussing something that interests me, I’m conscious that others may find this boring. It certainly does not concern me if, in these circumstances, people look at their phones. It is very different if you are meeting with one person, though one friend reminds me to take my iPad so that either of us can look for information if we go out for the day. Neither of us use it when eating together, though I have seen couples playing with their phones in restaurants and pubs. I believe that it is inexcusable to have a phone conversation in front of others and none of my friends does this. I am not entirely in agreement with you wavechange as rather than you having a slight appreciation of what the two others are talking about you will remain in ignorance of sporting matters. I am generally ignorant of teams and celebrities however the idea that I rebut the group I am with I find repugnant. The other side of this is that generally the content available on wi-fi devices seems to be written for the dimmest reader with the most sensationalist headline. What chance someone will read a serious article when regurgitated pap seems to cover the subject. Ben Goldacre has already outlined the role of the Press in misinforming and dumbing down medical matters. I’m happy to remain in ignorance of sporting matters and many other aspects of popular culture. I share your concern about the standard of much of what is available online. When with friends, if someone makes a point that I suspect or know to be nonsense, that prompts me to look for reliable information and having a tablet or laptop to hand makes it easy. Unfortunately, many cannot distinguish differences in quality of information sources. @Wavechange – I find The Daily Mash provides more than sufficient sports coverage, written in a style that is accessible to those of us with no interest in sporting matters. Also recommended for those who dislike politics. In fact, the only area where I find The Daily Mash lacking in quality coverage is consumer affairs. Hence Which? is my other main read. Personally, I don’t mind that much if friends check phones when we’re out and about. Having resisted getting a mobile for a long time when I was a teenager, as soon as I got one I realised how useful they are. Now almost everything I do is coordinated through my phone – emails, calendar appointments, messages, tweets etc. When I’m out with friends unless there’s a really specific reason I’ll keep both my phones in my bag, maybe checking if I go to the bar or to the toilet in case something important’s cropped up (I have a work phone and have to keep an eye on a few things out of hours, so turning the phone off completely is not always an option). I think the key thing with this, as with so many etiquette-related issues, is that it will depend a lot on the micro-culture of your own group: if I’m with certain members of my family, they’d consider it incredibly rude for me to use my phone during a conversation. However, with others, or within groups of my friends, it’s something that so many people do naturally that it wouldn’t be considered rude – just normal. I guess the key thing is to understand and empathise with whatever your friends like – after all, if they’re you’re friends then you should have a fairly good idea whether they’ll see your phone as an interruption or a necessary thing for you to do. I think this speaks to Morag’s point as well – there are certainly some people who find this a very useful way to cope in a social situation, and you’d hope that those around them would understand and recognise that rather than deem it to be rude. It occurs to me that it is being polite that allows rude behaviour to become a norm as the British do not object even when put out – especially by your mates. Escalation to the point where you all get out your phones to show you too have important matters and are not a Johnny no-mates soon establishes a norm. I suppose peer pressure is much the same as it was for alco-pops. I do seem to have Luddite tendencies and short of being responsible for national security the concept of needing to be in touch with work seems to suggest insufficient planning, organisation or delegation. Saddening. PS Are any of the regular posters going to stand for election to Council.? Need five proposers and the thoughts of several members make me think that commonsense is out there in the Consumer Association membership. Is there a Which? method to contact other members? Lets go back to the original example that Morag was unhappy with and turn it round. Do you break off your phone conversation when you are being served in a shop? Personally I would, as I think it is rude not to, and you are likely to hold people behind you up as you will not be so quick if you are trying to interact with the assistant, pack your things and find your money or remember your PIN while talking on the phone. What do others think or do and why? Having worked in various customer-facing roles over the years I realized I was there to provide a service to customers who were paying me for my services. Before mobile phones, it would be customers reading their papers or books, or talking to whoever was keeping their company at the time. Did I consider this rude? Not in the least. These people were not there for my company or to provide me with their attention. As long as they had the courtesy to say thank you when the transaction was complete, it was none of my business what else they were doing. In my current business setting, I expect my colleagues to respond to calls, texts or tweet from else where in the business as they are usually time sensitive, as I am expected to attend to my correspondences. In a social setting, this is still not an issue. If I am with acquaintances, I don’t know them well enough to make a judgment call. I don’t know what the reason is for them attending their phones, and it is not my business. With friends or family it’s even less of an issue. These are people I am comfortable to spend time with, sometimes in a companionable silence. I am with them for their company, not their attention. Picking up a message (or a sporting update or whatever) can also be a spur for further amusement and conversation.